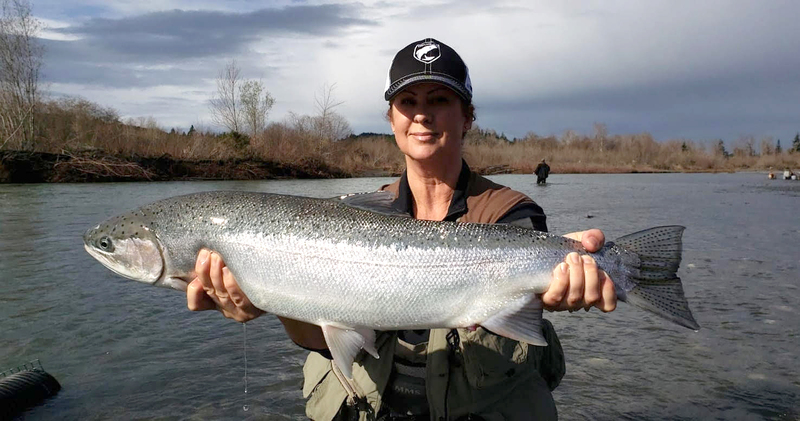 Trinidad resident Julie Jewell landed this nice hatchery steelhead while fishing the Mad River last Saturday. The steelhead, which measured 32-inches, is currently in first place in the Humboldt Steelhead Days fishing contest. For contest info, visit www.humboldtsteelheaddays.com/. Photo courtesy of Fred Contaoi. Some good news coming out of the fishing world – finally. During the ninety-fifth annual meeting of the International Pacific Halibut Commission (IPHC), it was announced that our Pacific halibut allocation for California will be set for the next four years at 39,000 pounds. This is approximately 8,000 net pounds greater than our 2018 quota. According to Tom Marking who sits on the PFMC Groundfish Advisory Panel, the commission was finally able to work out a compromise between Canada and Alaska on a blended allocation. “The Makah and WA Treaty tribes played a large role in achieving this as well, both politically and economically. “They spent all last year working with federal managers and politicians to make this happen. We all supported their efforts,” said Marking. Also on the halibut front, the CDFW is seeking input on the 2019 recreational Pacific halibut season dates. California anglers interested in the recreational Pacific halibut fishery are invited to participate in an online survey. The data gathered through this survey will help inform the CDFW about angler preferences for open fishing dates during the upcoming 2019 season, and will be used to develop recommended season dates that will be provided to the National Marine Fisheries Service. The survey can be found at www.surveymonkey.com/r/L3YG86Q, through Friday, Feb. 15. The Pacific halibut fishery takes place off northern California. In 2018, the fishery was open May 1-June 15, July 1-15, Aug. 1-15, and Sept. 1-21. The fishery closed Sept. 21 at 11:59 p.m. due to projected attainment of the 30,940 net pound quota. “It looks like we’ll be in an active weather pattern through early next week,” said Kathleen Zontos of Eureka’s National Weather Service. “A series of storms will be moving across the area through next Tuesday. Snow is in the forecast as well over the weekend. On Saturday, the snow level will be around 3,000 feet in Mendocino/Southern Humboldt and could drop under 2,000 feet by Sunday. For the period of Thursday through Tuesday, the Smith basin can expect from two to three inches of rain. The Mad basin can expect one and a half to two and a half while the Eel basin could see one to two inches falling. The Van Duzen watershed will likely see more snow than precipitation over the weekend. Showers are diminishing on Tuesday, but another front is forecasted for Wednesday night into Thursday. The timing and amounts of this system are a little uncertain at this point,” said Zontos. The Smith is low and clear and in need of rain. The bite has been tough, with quite a few zero’s this week due to the conditions. Flows were 8-feet on the Jed Smith gauge on Wednesday and dropping. It’s predicted to get down to 7-feet by Saturday afternoon. Friday’s rain is predicted to push the river to almost 9 feet by early Sunday morning. The South Fork was running at 2,000 cfs as of Wednesday and should be fishable on Thursday and Friday. The river is predicted to rise late Friday afternoon and will likely be blown out for the weekend and into early next week. Depending on how much and where the storms hit next week, it could drop back into fishable shape by late next week or the weekend.